As covered in the Huffington Post, research in to computational genomics carried out by Alan Kwan based primarily upon how faces have changed in the past, lead to the prediction of how faces will look 100,000 years in the future (created by Nickolay Lamm, a Pittsburgh-based artist). 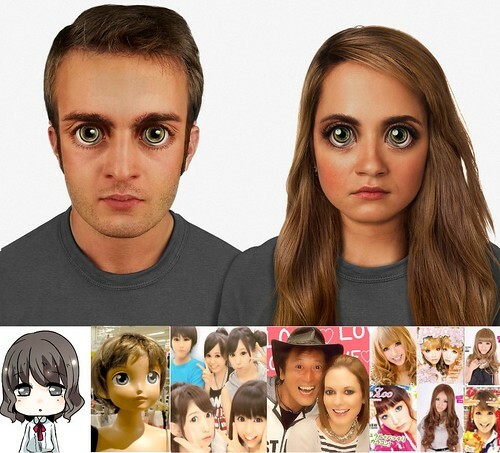 To anyone familiar with Japanese culture, these faces of the future are reminiscent of the faces portrayed in manga, the faces of recent Japanese clothes store mannequins, the downward angle and automatic post-processing of "purikura" (Japanese photo-me?) booths which automatically increase the size of the eyes (as can be seen especially in the photo of the non-Japanese lady whose right eye has been enlarged to protrude from the side of her face), and even the faces of "GAL" style models (gyaru,　ギャル）to be seen on the covers of Japanese magazines and even walking the streets. The hypothesis that humans will tend towards the GAL shape of face suggests that the Japanese have not merely been influenced by Western culture, but have taken the best bits of both cultures to create an amalgam that is objectively superior combining those features that will (Kwan argues) go on to be genetically preferred, and created by generations of humans to come. In Japan the future face is now. Centre Left: A mannequin in a local store in Yamaguchi Japan. Right: Google image search thumbnails for the keyword "ポップティーン" a popular magazine of GAL fashion.